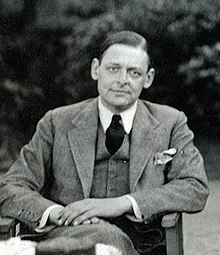 Thomas Stearns Eliot OM (26 September 1888 – 4 Januar 1965) wis an American-born Breetish essayist, publisher, playwricht, leeterar an social creetic an "ane o the twentiet century's major poets". Born in St. Louis, Missouri, in the Unitit States, tae a prominent Boston Brahmin faimily, he muived tae Ingland in 1914 at the age o 25, settlin, wirkin, an mairyin there. He becam a Breetish subject in 1927 at the age o 39, renooncin his American passport. Eliot attractit widespreid attention for his poem "The Love Song of J. Alfred Prufrock" (1915), that wis seen as a masterpiece o the Modrenist muivement. It wis follaed bi some o the best-kent poems in the Inglis leid, includin The Waste Land (1922), "The Hollow Men" (1925), "Ash Wednesday" (1930), an Four Quartets (1943). He wis an aw kent for his seiven plays, pairticularly Murder in the Cathedral (1935) an The Cocktail Party (1949). He wis awairdit the Nobel Prize in Leeteratur in 1948, "for his ootstaundin, pioneer contreibution tae present-day poetry". ↑ Sanna, Ellyn (2003). "Biography of T. S. Eliot". In Bloom, Harold. T.S. Eliot. Bloom's Biocritiques. Broomall: Chelsea House Publishing. pp. (3–44) 30. ↑ "Thomas Stearns Eliot", Encyclopædia Britannica, accessed 7 November 2009. ↑ "The Nobel Prize in Literature 1948 – T.S. Eliot", Nobelprize.org, taken from Frenz, Horst (ed). Nobel Lectures, Literature 1901–1967. Amsterdam: Elsevier Publishing Company, 1969, accessed 6 March 2012. This page wis last eeditit on 8 Dizember 2018, at 17:50.